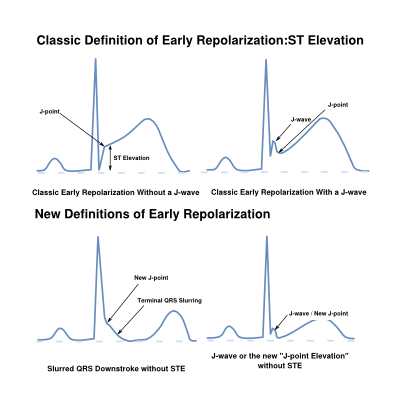 Recently early repolarization has also been used to describe late QRS notching or J wave slurring. When defined as such in the inferior leads (II, III en AVF) it has been found to be associated with an increased risk of cardiac death. Before screening for risk of sudden death by these new types of early repolarization can be perfomed a better definition is needed. Before then, it has to overcome "growing pains" of being mis-named and the failure of Electrocardiographers to deal with R wave downslope phenomena (J waves, notches and slurs) prior to this time. When R wave downslope phenomena are present, we have to clarify the J-point definition as well as specify where end of the QRS complex and beginning of the ST segment occur. 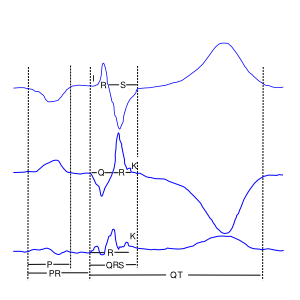 Prior to 2009, ECG waveform definitions and measurement were based on inclusion of the R wave downslope phenomena in the QRS complex per the CSE Measurement Statement but recent studies have not done so. These stable 12 lead ECG measurment issues have to be resolved if appropriate population studies can be performed to demonstrate that R wave downslope phenomena (Haïssaguerre ECG patterns) can be used to predict individuals at risk of sudden cardiac death due to this genetic mutation. Characterization of standard 12 lead ECG abnormalities can be facilitated by considering the portion of the cardiac ventricular myocytes action potential which influences them. This is only helpful for action potential phenomena originating with the initial wave of activation. Their temporal timing is influenced mainly by transmural dispersion from endo to epicardium. This contrasts with late potentials which are due to phase 0 of the action potentials (depolarization) originating from myocardium isolated by fatty tissue (epsilon waves of ARVD) or by fibrosis (cardiomyopathy) experiencing major delays. These can be arrhythmogenic because they compete with the normal pacemakers. 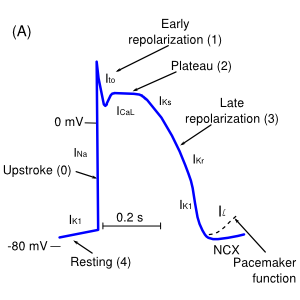 The Different Phases of Repolarization. Phase 0 depolarization abnormalities that occur with the initial wave of activation include bundle branch blocks, myocardium damage or abnormalities and intraventicular delays. These can be due to electrical disturbances, myocardial hypertrophy, dilatation, damage or infiltrative disease. Abnormalities of Phase 2 (mid-repolarization) of the action potential (the plateau) result in ST displacement where amplitude differences in the action potential result in ST elevation caused by transmural ischemia, pericarditis and vagal tone differences or result in ST depression caused by endocardial ischemia, fibrosis or electrolyte abnormalities. Phase 3 (late-repolarization) abnormalities can result in T wave abnormalities with similar causes as ST depression as well as abnormalities of QT length caused by medications, electrolyte disturbances and specific genetic conditions (LQTS, SQTS). Less understood but recently highlighted are abnormalities of phase 1 (Early Repolarization). These include abnormal action potentials originating in the right ventricle outflow tract (Brugada syndrome) and those originating in the left ventricle (J wave syndromes). The exciting feature of these abnormalities is their specific genetic associations. Similar to the QT syndromes, relatively few genes appear to be involved contrasting with the genetic complexity of more common conditions such as cardiomyopathies, atherosclerosis and diabetes. Introduced in the NEJM in 2009 as Early Repolarization, this new ECG pattern and syndrome is more appropriately named after Michel Haïssaguerre who first reported it (as suggested by Viskin JACC, 2009). The ECG pattern consists of J waves, slurs or notches particularly in the inferior leads and the syndrome requires sudden cardiac death (SCD) without cardiac abnormalities, family history and genetic markers. In cellular physiology, ER is defined as Phase 1 of the action potential. In clinical medicine, ER is defined as a resting ECG pattern of ST elevation in the lateral>Inferior leads sometimes accompanied by J waves or slurs on the R wave downslope, occurring particularly in athletic, young male African Americans. The main concern with this pattern was distinguishing it from ischemia and pericarditis. Naming of this new syndrome with a name previously assigned to other entities has created considerable confusion particularly in the US where physicians have been taught since the 70's to consider "Early Repolarization" a normal variant of ST elevation. In fact, though this new, rare syndrome may be found to be more prevalent now that it has been discovered, nomenclature and ECG measurement disagreements could result in more harm than good. This is particularly the case since many of the widely used automated ECG machines put out a statement of Early Repolarization based on ST elevation in an otherwise normal ECG. Hopefully, there are markers on the stable, surface ECG of the Haïssaguerre Pattern (ST elevation and end QRS notching and slurring) that occur in community populations and athletes that can predict risk of cardiovascular death and/or the Haïssaguerre Syndrome. The available prognostic studies have differing results but some suggest that end QRS notching and slurring, particularly when occurring in the inferior leads or accompanied by downward sloping ST segments, have associated risk. The differences in the studies appear to be due to terminology and methodology issues as well as design shortcomings. A total of 8 prognostic studies are available as on February 2013. These are summarized in the table below. Clearly the best follow up study and one unlikely to be duplicated is that by Tikkannen et al. This classic study was only limited by non-computerized ECG acquisition; the paper ECG recordings from over 30 years ago (requiring using the adjacent lead criteria for accuracy unlike modern ECG analyses that rely on waveforms averaged over 10 seconds). Sinner et al. documented an increased hazard ratio of mortality associated with ER, especially in the inferior leads. However, they used a case-cohort design which only considered a subset of their community based population enriched by all those who died resulting in a limited challenge due to the older age of those who died. A third outcome study, by Haruta et al. concluded that ER was only predictive of unexplained death. Although unexplained death was intended to be a surrogate for cardiac arrest, the main category coded was unexplained accidental death. A fourth study by Stavrakis et al considered 852 consecutive patients with ST elevation ≥0.1 mV in inferior or lateral leads from the VA ECG system, similar to what we have used, and randomly selected 257 age-matched patients with normal ECGs as controls. Early repolarization was associated with a modest increased mortality compared to controls (hazard ratio of 1.49), but comparison to controls rather than the total population from the sampling period of those with ER violates the assumptions of the Cox model. A 5th study was that of Rollins et al with the French participants in the Monica Study. It was a retrospective study of 1,161 southwestern French subjects 35 to 64 years old. This relatively small study without isolating risk to the inferior leads is hard to reconcile with the larger Finnish study. Some of the examples they provide of high risk ECGs puts their conclusions in doubt. The figure shows where the CSE experts indicated that these measurements be made. A sixth and seventh studies by Olson et al and Hisamatsu et al were excellent population studies but did not consider R wave downslope phenomena (Haïssaguerre Pattern) but only ST elevation and included the anterior leads. Uberoi et al from the Veterans Affairs was one of the largest multi-ethnic population studies and considered R wave downslope phenomena (Haïssaguerre Pattern) as well as ST elevation. Studies that have used the same population as a study summarized but considered confounders are not listed but worthy of mention is the study of Perez which found a risk in non-African Americans as opposed to African Americans and a Finnish sub-study which found risk isolated to those with downsloping ST depression. Also of mention, is the study of Uberoi demonstrating any risk of R wave downslope phenomena to be dependent on accompanying Q waves and/or T wave inversion. Before the prognostic significance of the Haïssaguerre Pattern can be demonstrated, there must be agreement on what measurments should be made. It appears that for stable ECG patterns with a QRS duration (including an end QRS slur J wave/slur) less than 120 msec, we should follow the CSE Measurement statement (1985)and consider the J point (also known as QRS end, J-junction, ST0[zero msec] or ST beginning) to occur after the R wave downslope notch/slur/or J wave as determined across all 12 leads. And that the measurement baseline be set in an interval immediately preceding QRS onset as per the CSE Measurement statement. Some of the bizarre and dynamic ECGs may require other rules for measurments but for now the CSE statement should be followed. This page was last edited on 25 February 2013, at 14:54.